Tears came to the big strong man’s eyes as he read out loud in his own Spanish language the words from Romans 5:8: “But God commendeth his love toward us, in that, while we were yet sinners, Christ died for us.” And he hurried out of the room. We were in one of the homes this summer that the House Church worker had led us to in Cuba that day. He was, the Church worker said, a “hard case” … but his wife had been praying for him. When he had composed himself, the man came back into the room and, with a little further discussion through the translator and a little more from the Bible, he prayed to receive the Lord as his Savior. It was another wonderful moment! He and his wife both gave great big hugs. The end of summer sees the completion of many short-term mission trips from thousands of churches, of which this was one – and one in which our new Spanish translation of 101 Scientific Facts and Foreknowledge was handed out to the Cuban partner workers. Because of the Communist atheist government still in power, it was important to be careful. But the booklet was a well-appreciated gift! The trip was full of spiritual fruit, and it was a blessing to see the hunger and sincere appreciation for the gospel-witness both by the Cuban House Churches and by the people we visited! There is indeed a great spiritual harvest going on in many downtrodden places in the world today. The oppressed and poor of this world, God has chosen to be rich in faith (James 2:5). “Come unto me, all ye that labor and are heavy laden, and I will give you rest” (Matthew 11:28). This is the promise of our great Messiah, our great Creator and King! It was wonderful to see so many people interiorly awaken to Jesus knocking on the door of their hearts! 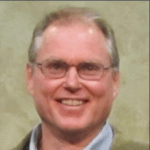 The “great mystery” of the Bible, as we discussed in last month’s letter, is the great spiritual union of Christ in us and us in Christ – a great Oneness! When that happens, in a spiritual sense “the eyes of the blind shall be opened, and the ears of the deaf shall be unstopped” (Isaiah 35:5) – and we are invited to begin and continue a radical love relationship with our Lord! Creation itself is powerful in drawing us in to a knowledge of Him, and He makes a “first pass” through the gateway of our hearts by “what has been made” (Romans 1:20). These are glimpses of His glory! For example, we are struck by the wonder and perfection of babies; or by a great flock of birds in a grand sky landing in synchronous flight into the trees; or by a gradient of colors from orange to gold to purple in a sunset in the clouds behind the mountains, its glorious light reflected also by a lake in the foreground. And the Lord makes more “passes through the gateway to our hearts” by the intimate revelation of Himself, the living Word who became flesh. Our part is to simply receive and reciprocate His love and fidelity. He does the rest. “He shall feed His flock like a shepherd: He shall gather the lambs with His arm, and carry them in His bosom, and shall gently feed those that are with young” (Isaiah 40:11). We do not have to strive. God loves us so very much even though He knows us thoroughly! Think about it. He is smitten by us, even though He knows all our failings and even though we ourselves can’t abide with our own failings! He is the Bridegroom in love with a fiancée who can’t understand what the Bridegroom sees in her! Why do we allow our joy to be robbed by beating ourselves up when He loves us in spite of ourselves? God says we are precious, even in our brokenness. Who are we to say differently? Rather, we can and should be rejoicing in our status with our Maker! Like the bride, our role is to receive the love proffered by the bridegroom and respond and reciprocate. When that is the case, the love relationship blooms and grows into increasing levels of joy and, indeed, ecstasy beyond words! (Song of Solomon) Truly receiving His infinite love is the beginning – the beginning of opportunity for an ongoing reciprocated mutual crossing of a spiritual gateway of faith and love to increasing union and fellowship with the Lord. This gateway is awakened in the depth of our souls. Jesus will keep crossing that gateway even as we reciprocate His great love in the manner of bride and groom – “…continue in my love…that my joy might remain in you, and that your joy might be full” (John 15:9-11). It is “joy unspeakable and full of glory” (1 Peter 1:8)! God dwells in unapproachable light, but also in unlimited delight! That’s what the Bible says (Psalm 16:11). And He wants us to taste and see – even now before eternity! “Now” we can share in the glory of God dimly as through a hazy glass, but the “hazy glory” is still accessible and is His will to be experienced! “Then” we shall see face to face and we shall know in full even as we are already known (1 Corinthians 13:12). The Word of God is true. It is not to be explained away by the foolish arrogance and limited knowledge of man. It is, as the Scripture says, “alive and active” (“quick and powerful”) (Hebrews 4:12); it is “God-breathed” (2 Timothy 3:16). And this is what our ministry at Creation Moments upholds! 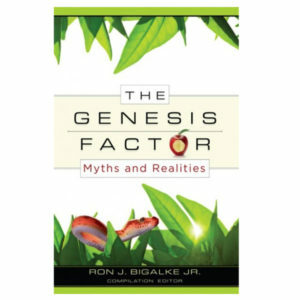 The Word of God is true in the most complete sense of the term, with a truth that flows through all reality – physical, psychological, and spiritual. It is there to be believed and trusted, able to guide us into knowledge, wisdom, joy, freedom, and life eternal and abundant! It has the spiritual power to interiorly awaken people – as I saw abundantly and rejoiced in with the Cuban Christians and the outreach this summer! Many Christian institutions have compromised with the world in regard to the truth of God’s Word. We will not do that. Thank you for helping us to stand with God’s Word and to encourage others in the transformative power and truth of the Word of God in their lives! P.S. This month I’m excited to bring you a DVD we produced that demonstrates God’s incredible power and creativity in the world He made! 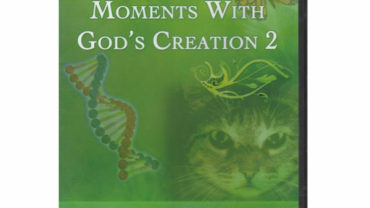 Moments with God’s Creation 2 contains 25 short videos showing that biblical creation is far superior to evolution in explaining our magnificent world. You and your family will see God’s hand of design in everything from jellyfish to the octopus. And you’ll explore many intriguing topics such as is there life on other planets? 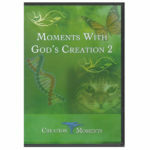 I will be happy to send you Moments with God’s Creation 2 for a tax-deductible donation of only $15 or more. 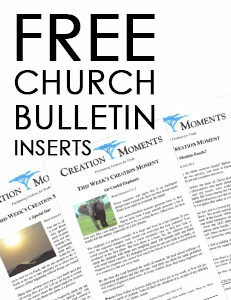 Plus, I will send to you – or to anyone who makes a donation of any amount – our very latest CD of Creation Moments broadcasts. Simply click here to make your donation online or call us toll-free at 1-800-422-4253 during regular office hours … and I will have these items shipped to you without delay. Please note that the minimum donation of $15 barely covers our production costs and shipping expenses. So please be as generous as you can to help Creation Moments continue the work our Lord has set before us. Thanks, too, for keeping us in your prayers!